Police at the scene in the Douglas area of Dundee. A 54-year-old man has been arrested following an 11-hour stand-off in the Douglas area of Dundee on Sunday. 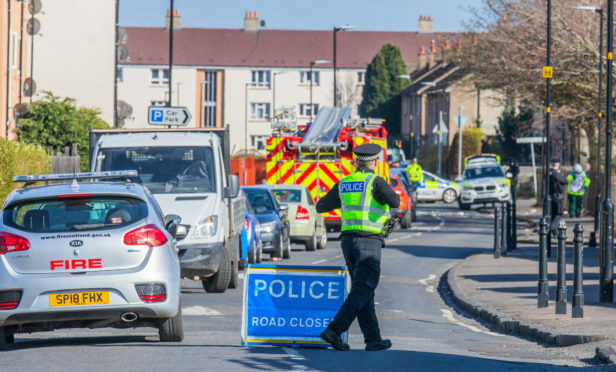 Several roads around Balmoral Terrace were closed and adjacent flats evacuated because of the incident, which began in the early hours of yesterday morning. Residents in Balmoral Terrace woke to find the streets around their homes in virtual lockdown because of the drama. Officers were posted at either end of Balmoral Terrace and a number of nearby roads were sealed off to traffic. Crowds of onlookers braved the windy conditions to watch the incident unfold during the morning but drifted off as negotiations with the man dragged into the afternoon. Firefighters and workers from gas company SGN were also called out to Douglas in case their assistance was required as a result of the disturbance. Fire crews also set up a mobile command unit in front of the shop units on Balmoral Terrace. A spokesman for Police Scotland’s Tayside Division said officers were first called to Balmoral Terrace at 4.40am on Sunday. It is understood a man had barricaded himself in his flat and had thrown items from his top floor flat on to the ground below. He appeared at the window of his flat sporadically throughout the morning as he spoke to officers. Negotiations lasted for nearly 11 hours before he was finally taken into custody just before 3pm. Flats nearby were evacuated as a precaution although police stressed there was no wider threat to the public at any point during the altercation. Other residents in nearby closes were told to remain in their homes until the incident was concluded. Emergency services remained on the scene for a short time after the man was detained in custody. One onlooker said she knows the man who was the centre of the incident. Another witness said: “It seems to have been going on from early morning back of 5 or 6am. “The man has smashed all his windows and been throwing stuff out on to the street. Police Scotland chief inspector Michael Whitford confirmed the man had been arrested and detained in custody.